here in austin, someone hacked a construction sign to say: careful! zombies ahead! gymnast20, if you would like to know how, just ask my bff D. Mendez. That's just a little bit awesome. I LOVE THIS SIGN! 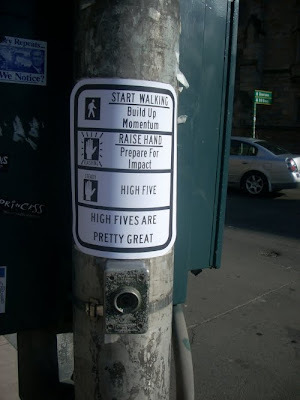 And yes, high-fives ARE pretty great. Somebody painted a skateboard under the walking person on the crosswalk sign. It looked like it belonged there & I didn't notice until somebody pointed it out. Unfortunately, someone who probably thought they were doing a good deed painted over it, but the yellow didn't match & now it's UGLY. Even though it looked great before. High fives ARE pretty great. OMG! I tink this is hilarious! Gosh! Way to go!